We use cauliflower ALL THE TIME. 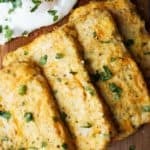 Of all of our low carb cauliflower recipes, these cauliflower hash browns just might be our favorite! They are the perfect combination of simplicity and deliciousness. So if you’ve been looking for an easy low carb hash brown recipe, look no further! Before I moved to San Francisco I had no idea how huge of a trend brunching was. All the new friends I had made always suggested brunch and who was I to say no to one of the best meals ever created. You could have pancakes and a burger in the same meal for gosh sake! And so, after moving back to Philadelphia I wasn’t going to let the Sunday brunch tradition die just because I now lead a keto lifestyle. I had to reinvent brunch because it is just that worth it! So I present to you my Cauliflower Hash Browns which are not only super easy to make, but are a great bed for eggs, bacon, and avocado. On the other hand they could also just as easily be topped with ground beef, sour cream, guacamole and cheese! What I love most about these healthy hash browns, besides the low net carb count, is how easy they are to make. With only three ingredients you’ve got yourself a stand alone meal or a delicious side that unites several different foods! You can have it for breakfast, lunch or dinner. Another awesome feature of these is that they are cauliflower hash brown patties. So you can toss them in the fridge and reheat them at your leisure! When I first made these Matt was overwhelmed with many different emotions. He had an excited look in his eye as he went to grab one and when it didn’t fall apart in his hand he giddily laughed and bit into it. “It’s like a real hash brown!” he exclaimed. At the time I was just experimenting, but I could tell form his reaction, as I usually can, that this was a recipe I needed to share. Low Carb Hash Browns, At Last! Just the other day someone left a comment on one of our videos stating “It’s the small things, ya know?” and I couldn’t have agreed with her more. I apply that to all aspects of my life, including my keto lifestyle and the food I make as a part of KetoConnect. A thing you may not know is that we treat every new recipe like a baby, and these Cauliflower Hash Browns are no different. When I first saw them as they came out of the oven I was jolted back to my childhood of when my dad would take us to get McDonald’s breakfast every weekend. I only ever got their hash browns and orange juice – great breakfast, I know haha. The point of that story is to show you that for me this recipe signifies a lot more than just what they do in the form of brunch. They bring me happy memories of my childhood and they make the love of my life, Matthew, giddy with emotion. It’s the small things, ya know? Check out our other cauliflower recipes like our Cauliflower Fried Rice or incredible Cauliflower Mac and Cheese! Microwave for 3 minutes and let cool. Place in paper towels or cheese cloth and ring out all the excess water. Place rung out cauliflower in a bowl, add rest of ingredients and combine well. Form into six square shaped hash browns on a greased baking tray. Place in a 400 degree oven for 15-20 minutes. Let cool for 10 minutes and hash browns will firm up. Serve warm Enjoy!